534kms ❖ 14,450m ❖ 8 Days/7 nights ❖ From 2200€ pp. Ride difficulty 9/10: You must be a good climber and descender for this trip. Not our biggest tour but almost 15,000m of climbing (and descending!) in a week is a lot. Day 1: Pick up at GVA (Geneva Airport), time to be determined. The riders that are bringing their own bikes can build the bikes at the airport and store the box there. Drive to Albertville, 2 hours. Day 2: Ride Albertville to St. Jean de Maurienne. One Col today; the Madeleine. Ride extension is the Lacets de Montvernier. We spend two nights in St Jean de Maurienne. Day 3: Loop ride from St Jean de Maurienne to the south and the lesser known (to cars that is) Col du Mollard via the serpentine road to Albiez and then on to the steep climb to the Col de la Croix de Fer and the Glandon. You also get a second crack at the Lacets de Montvernier today if your legs have enough juice in them. Day 4: Ride from St. Jean de Maurienne to Le Bourg d’Oisans. Today is the biggest day of the week. Cols are the Télégraphe, the mighty Galibier and Lauteret. Two nights in an amazing cyclist's atmosphere in Bourg d'Oisans. 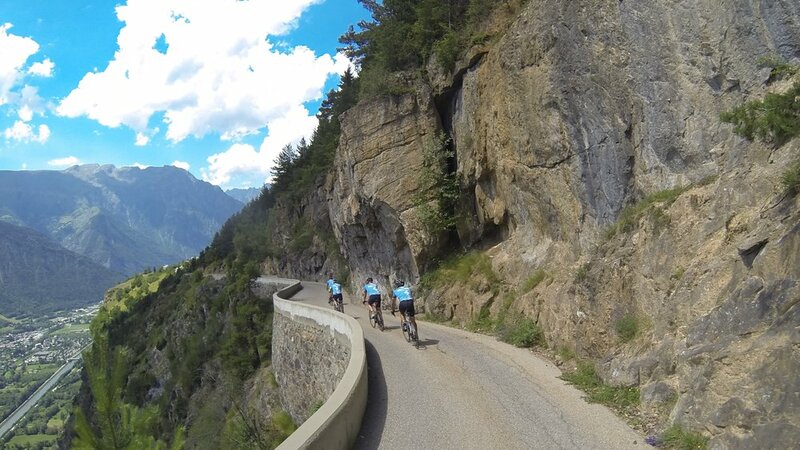 Day 5: Ride up one of THE classic climbs in all of professional cycling; Alpe d’Huez. Thankfully the climb is missing the 400,000 screaming fans when you are pedalling. 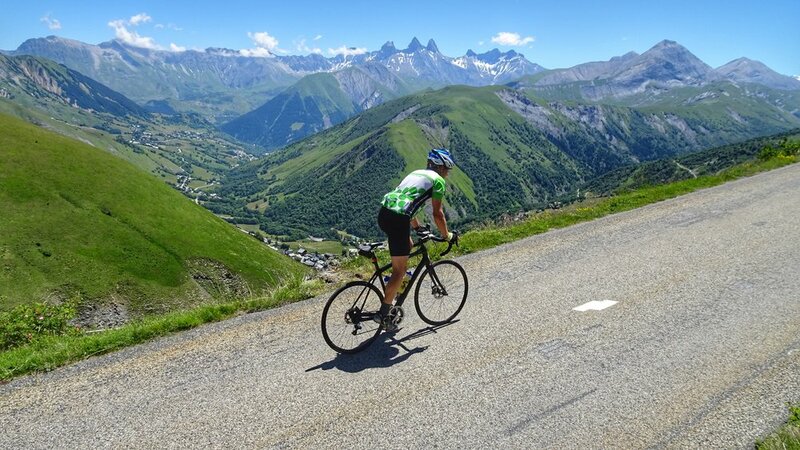 Your choice when you reach the village of Alpe d’Huez, 21 switchbacks later, is to continue up to the wild Col de Sarenne (2013 Tour de France) or descend back to your shower and a beer in Bourg d’Oisans. We prefer the first choice, because ... after the Sarenne we have a nice surprise for you; the little-known Route de la Roche d’Auris. Very few tour operators ride or even know of this road. Narrow, single lane, steep drop offs and tunnels. This is your road to that aforementioned beer. Enjoy! Day 6: Today we ride to the former Winter Olympic host city of Grenoble. This is the biggest day for distance but not for meters climbed. We start with a 34k gentle downhill then climb up to the ski resort of Chamrousse, just outside of Grenoble. All of the day’s climbing is here. From the village at the top there is a beautiful twisty descent into the bustle of Grenoble 1600m below. Our hotel is right in the city center. Day 7: Grenoble to the middle of nowhere, the Vercors, a famous region for French resistance during the second World War. And very famous for it's gorges. We pass by an empty village, the remains are still as the Germans left it on July 23, 1944; a burnt out ruin. Today we leave most of the cars behind in Grenoble. This is one of our favourite regions and you will soon see why. One night in La Chapelle en Vercors. Day 8: Last day of this incredible trip. Today we ride the Combe Laval (which will absolutely blow you away! ), the climb to Presles (ditto) and the unbelievable Gorge du Nans (big ditto). Today’s ride ends at the train station in the little village of Vinay, close to the autoroute for our 2 hour return trip to Geneva airport. You will have ridden on 3 of Frances coolest roads today - that’s a TTT promise!